As far back as I can remember, I’ve always had trouble finding the perfect light scent that I can use on a daily basis–a subtle fragrance that doesn’t suggest I’m a pubescent teenager dousing myself in cologne for a change. 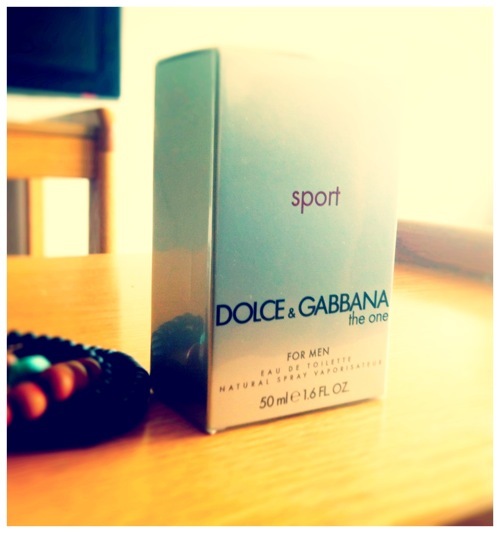 Up until recently, I hadn’t found one until Dolce & Gabbana sent me their latest fragrance to their Spring collection, The One Sport. 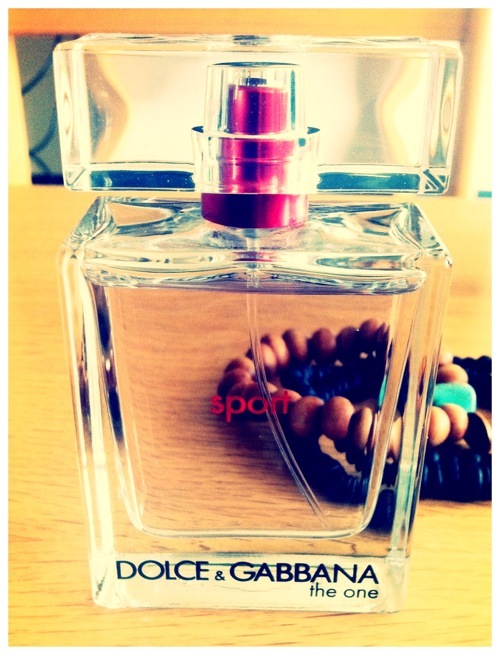 Three words that come to mind when I think of The One Sport: fresh, clean, and energetic…the same three words I would use to describe any perfect sporty fragrance. I received a sample about a week ago, and I’m not even gonna lie, I’ve been wearing it out every single day. You can pick up on traces of fresh rosemary, a hint of woodiness with sequoia, and a bit of sweetness at the base from some aromatic patchouli. The contrast between all of those components and the perfect balance leads to a very bold yet subtle statement; this isn’t the type of cologne that would in any way offend anyone’s nostrils. Rather, its energetic and pleasant enough to generate occasional compliments amongst anyone who comes in contact. While walking around on campus last week I briefly encountered a few females who expressed only positive sentiment as soon as the scent graced their own nostrils :). The best part about the cologne was the mixed and affirmative reactions — a few people mentioned it to be a nice fragrance during the summer, while others said it’d be something they’d rock in the winter as well. Which can only mean one thing: it’s just a fragrance meant to be worn year round. To all my fellow guy readers (or ladies if you’re looking around for your men), get this if you need something to wear on the daily and that doesn’t scream ‘HEY SMELL ME!’ Where would I wear this cologne? I’m pretty sure I’d be rocking it on the beach this summer. Or after I work out and shower. Maybe to work, or even out to dinner. Really, anywhere. The One Sport is available at Macys.com, Bloomingdales.com and select specialty stores for the following prices: $45 (1 fl oz), $57 (1.6 fl oz) and $73 (3.3 fl oz). What’s your summer go-to cologne? Would you check The One Sport out yourself? Yup. 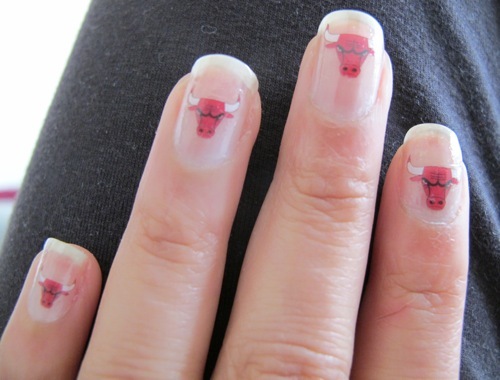 Chicago Bulls Nail Tattoos. I actually was wondering a few months ago if team nail tattoos existed, and after a quick Google search, I found them and stocked up. 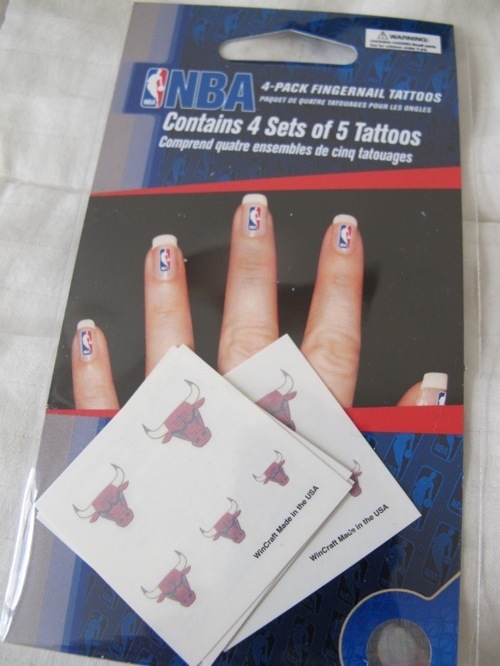 I bought four packs of these specifically for the playoffs either on eBay or this site: CBS Sports–I can’t remember now–but they were only $1-$2 for a pack of 4 sets (20 tattoos). You can also find them on Amazon.com, or Party City. I noticed they’re a lot easier to find now that the playoffs have officially started! Thought it was a fun way to show some team spirit. 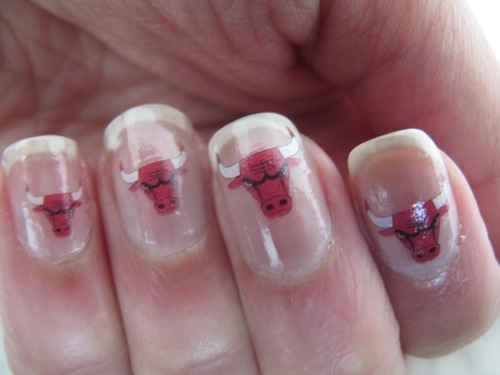 What are some other non-traditional ways you show your team support?? This post was a long time coming because something people always ask me for are my foundation recommendations. 1. Physicians Formula Youthful Wear Youth-Boosting Foundation ($15) – I was a little skeptical that this would serve my needs at first because of its limited color range (it only comes in fair, medium and light), but this lightweight foundation is velvety smooth and camouflages so well with my skin color. It’s also a cosmeceutical, claiming to reverse visible signs of aging over time by restoring firmness and elasticity over time (in their studies, 100% saw less deep wrinkles and; fine lines instantly and 94% saw lifted and firmer-looking skin after 3 weeks). Plus it has zinc oxide for sun protection (SPF 15). PF products, in my experience, always come through with their claims and still maintain such an affordable price. The brush that it comes with (not pictured) is also perfect to get into trick corners. So good, my mom has since stolen it from me! I use it in Medium. 2. 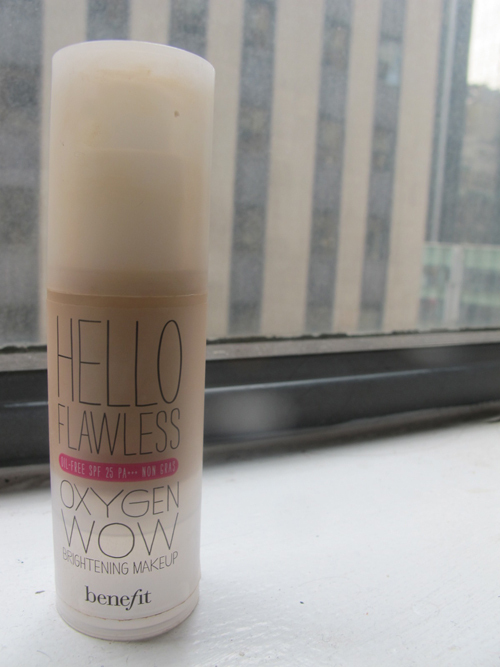 Benefit Hello Flawless Oxygen Wow, $34. THIS foundation is easily one of my new favorites that truly, truly got me through Fashion Week a couple months ago. FW is basically one of the most exciting, but exhausting, weeks in my career and I tend to start looking a bit zombie-ish by day two. This foundation has an incredible light-diffusing (read: brightening) property that “wakes” my face right up. And it’s buildable, so you can get light-to-heavier coverage without looking cakey at all. My skin loves its oil-free formula too — I never broke out from it (knock on wood), and my it doesn’t feel like there’s a lot on (my skin can breathe — hence the OXYGEN). It’s Benefit’s very first liquid foundation, and the wait was well worth it. I use it in Beige and TIP: use it with their POREfessional PRO balm for a truly flawless finish. 3. CoverGirl & Olay Tone Rehab 2-in-1 Foundation Base, $14. This to me is in between a tinted moisturizer and a full-coverage foundation, and a perfect “if you’re going to only wear one thing before you leave the house, wear this” product. It has Olay’s serum to fight fine lines and wrinkles and actually improve skin tone over time. I’m just the type of person who normally can’t wear any makeup unless I use a dollop of moisturizer on first, but this is one product that I can wear right after washing my face because my skin drinks the creamy texture up. 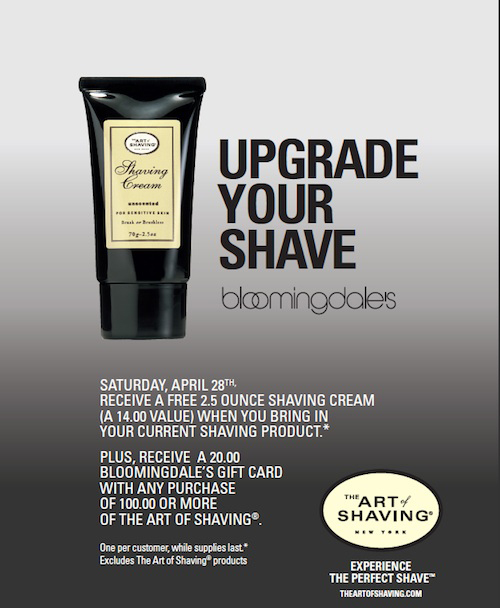 An awesome complexion-perfecting product. I feel like it gives a tiny bit less coverage than a proper foundation so I’ll go over any spots with a concealer if needed (read here for my favorite concealers). I use it in Soft Honey. 4. Laura Mercier Oil Free Suprême Foundation, $42. Makeup artist Laura Mercier is known to create flawless faces for a reason. This foundation is money and the newest addition to Mercier’s line. Just a little goes a long way for a airbrush-esque finish. Plus, it contains all sorts of antioxidants like green leaf tea extract and moisturizing vitamin E. When I know I’m going to have a long day, I’ll reach for this foundation. It has an 8-hour wear and feels so light on my skin. I use it in Honey Beige. 5. 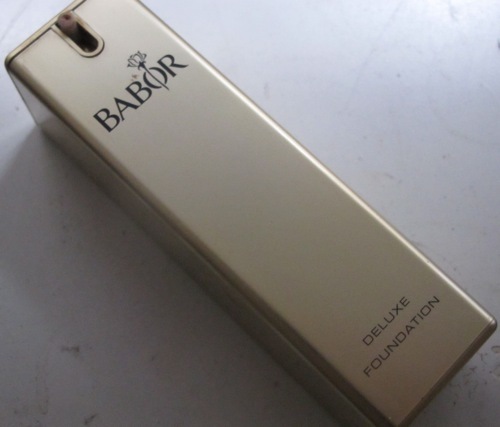 Babor Deluxe Foundation, $42. This was one of those serendipitious finds for me. I had a sample of this from another makeup order, but just one application and I was sold. It has the most creamy texture and a little goes a LONG way. The coverage is amazing, and definitely the heaviest of all the foundations here. That’s also why I reserve this strictly for weddings or bigger events. Even though it covers so well, it doesn’t look cakey at all. Plus it lasts through the night. It’s one of my absolute favorites that I wish I found earlier. I love that it has amazing hydrating properties with its wheat protein and cell-regenerating lupines oil (if you already have oily skin, it’s probably not for you since it’s clearly not oil-free but if you need a little more coverage for imperfections, try this one!). I use it in Almond Beige. 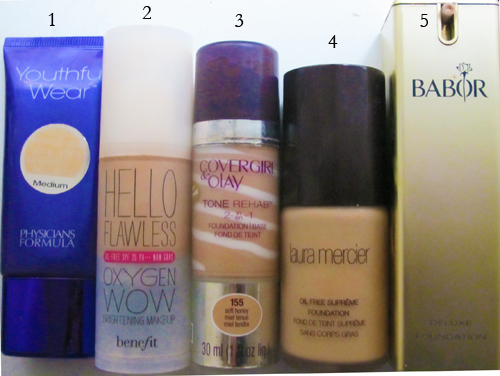 So those are my picks…which foundations do you love? Ever caught your child trying to cut their own hair? I know I had plenty of friends who did! 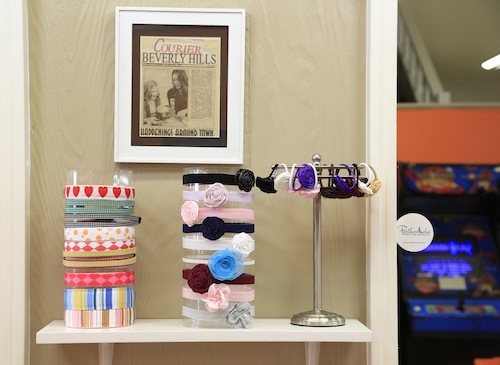 Fortunately, there’s Tipperary — one of the first children’s-only hair salons in Beverly Hills. 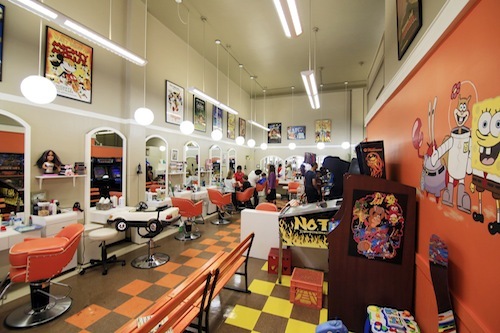 In celebration of their 40th anniversary, the salon revealed their brand new renovated space with bright colors and paintings of some of your kid’s favorite characters to share their haircut experience! Walking into the space (which is practically a giant play area), you’ll notice they have everything to give you kids a fun and unique hairstyle — colored hairbands, stylish Featherlocks, and even “HairChalks” to streak hair with funky colors (don’t worry parents, it washes right out). 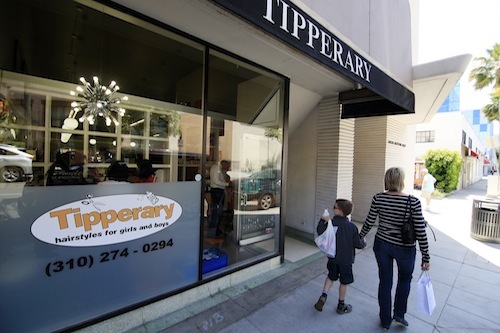 Tipperary uses two hair product lines, Little Twig that only uses organic ingredients, and Paul Mitchells Kids, leaving your child’s hair shiny and healthy. Plus, their prices are pretty reasonable: first time customers pay $30. You can even get a picture for your child’s first haircut ever! There are several arcade games, all for free, along with plenty of toys and board games for children to enjoy while waiting for their turn or even while getting their hair done (distracted kids are usually not-crying kids, yes?). Check them out. 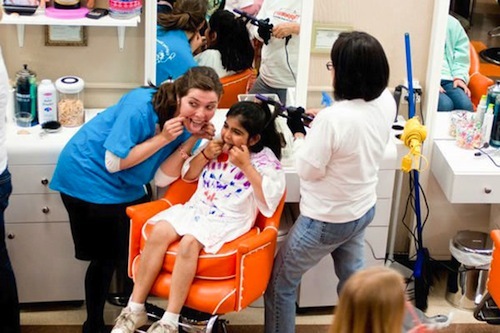 If you and your children are able to join in on all the fun Tipperary has to offer, I’m pretty sure your kids will never even think about trying to cut their own hair again :). 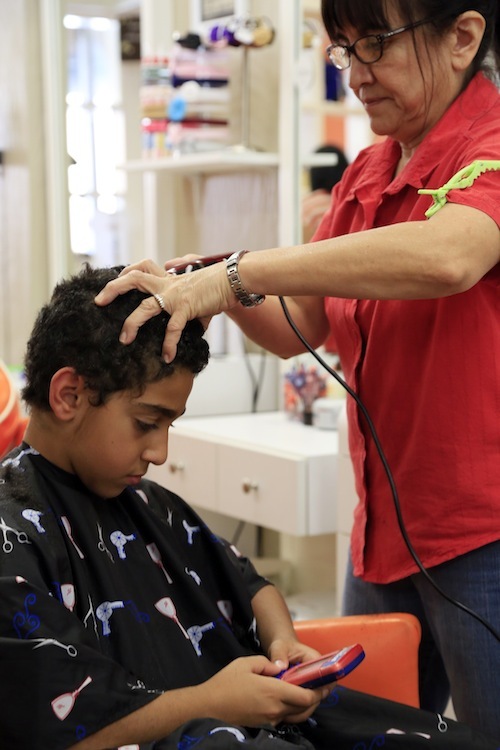 Where do you go for your kid’s haircuts? 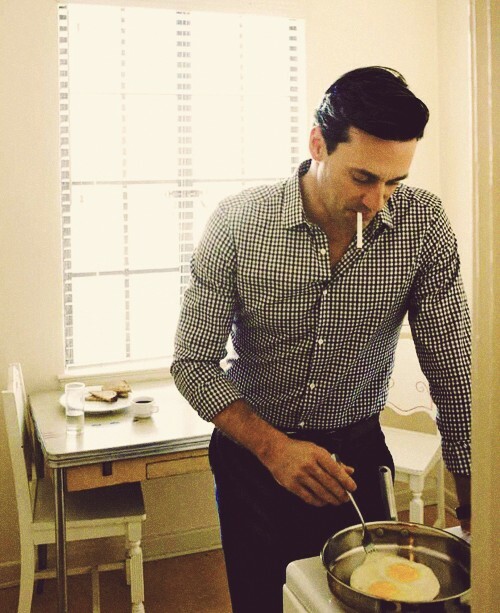 Makes me wanna watch Mad Men.